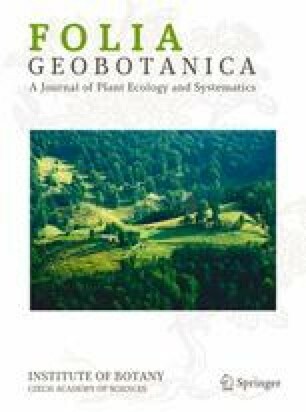 We investigated the relationship between soil pH/calcium content and species richness of vascular plants in seven broadly defined Central European vegetation types, using Ellenberg indicator values for soil reaction and a phytosociological data set of 11,041 vegetation sample plots from the Czech Republic. The vegetation types included (A) broad-leaved deciduous forests, (B) meadows, (C) dry grasslands, (D) reed-bed and tall-sedge vegetation, (E) fens and transitional mires, (F) perennial synanthropic vegetation and (G) annual synanthropic vegetation. Relationships between local species richness (alpha diversity) and pH/calcium were positive for vegetation types A and C, negative for D and G, unimodal for E, and insignificant for B and F. Ellenberg soil reaction values explained 37% of variation in local species richness for vegetation type E, 24% for A, 13% for D, but only less than 4% for the others. Species pool size, i.e., the number of species that can potentially occur in a given habitat, was calculated for each plot using Beals index of sociological favourability applied to a large phytosociological database. For most vegetation types, the relationships between species pool size and pH/calcium were similar to the relationships between local species richness and pH/calcium, with the exception of meadows (weak unimodal) and perennial synanthropic vegetation (weak negative). These patterns suggest that for those types of Central European vegetation that developed independently of human influence in the Pleistocene or early Holocene (dry grasslands, deciduous forests), there are larger pools of calcicole than calcifuge species. This pattern is also found at the level of local species richness, where it is, however, less clearly pronounced, possibly due to the predominance of a few widespread and generalist calcifuges in acidic habitats. The unimodal pattern found in mires may result from similar underlying mechanisms, but in high pH environments mineral-rich spring waters probably decrease species richness by having toxic effects on plant growth. By contrast, vegetation types developed under direct human influence (meadows, synathropic vegetation) show weak negative or no relationships of local species richness or species pool to pH/calcium gradient. These results support the hypothesis ofPärtel (Ecology 83: 2361–2366, 2002) andEwald (Folia Geobot. 38: 357–366, 2003), that the modern calcicole/calcifuge disparity in the species pool of Central European flora has resulted from historical and evolutionary processes that took place on high pH soils. In the Pleistocene, calcareous soils dominated both the dry continental landscapes of Central Europe and glacial refugia of temperate flora, which were mostly situated in southern European mountain ranges with abundant limestone and dolomite. The negative pattern of species richness along the pH/calcium gradient found in reed-bed and tall-sedge vegetation, however, is not consistent with this historical explanation.